Choosing the proper chemical containers for your hazardous materials can be tricky, especially if your aim is total safety and compliance with government regulation. There are many considerations that go into selecting and designing your chemical containers and it can often be an overwhelming process. Are my permits in order? Do I have the right building? Is my facility safe despite my chemical storage? 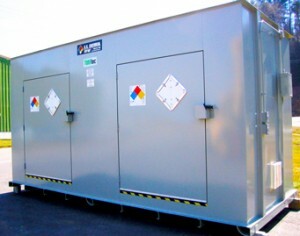 At U.S. Chemical Storage, we can help you with the last two, granting you total compliance and peace of mind. U.S. Chemical Storage has a long tradition of engineering the safest chemical containers in the storage industry. With our help, you can rest assured that your chemical storage totally compliant with safety regulations. Our experienced personnel are dedicated to bringing you the highest-quality chemical containers to help you protect your facility, community, and environment from potential hazards. Make sure you understand the requirements for the particular chemical you’re looking to store. Doing so will enable you to provide your facility with enhanced protection through proper chemical safety procedures, such as good housekeeping and proper segregation of incompatible chemicals within your chemical containers. It will also allow you to select the proper accessories to furnish your chemical containers so your chemical storage is safe and compliant. The best way to understand your chemical storage requirements is through studying a material safety data sheet (MSDS) or safety data sheet (SDS). Understanding the chemical characteristics is the first step to practicing safe chemical storage. In order to achieve total compliance with government regulation, you must first understand the laws that pertain to your chemical storage. These laws can be accessed through the EPA, OSHA, and NFPA and are designed to prevent hazmat situations and provide protection, should a hazmat situation occur. Your chemical containers should be designed with total compliance; this is the only way to maximize safety and prevent hefty unwanted fines. Ensuring your permits are in order can help to facilitate the process of designing and engineering your chemical containers, allowing us to help you efficiently and without pause.